When doctor/patient relationships get a little too close, sometimes bizarre things can happen. Take for example, the case of Dr. David Newman, an emergency room physician at the Mount Sinai Hospital in New York City. Dr. Newman is accused of drugging a patient and then ejaculating onto the patient’s face. If that is not bizarre enough, his defense should qualify him for admittance into the Guinness Book of Records under “strange and untenable” defenses used in the commission of a crime. See HuffPost Crime and ABC7 Eyewitness News for the complete story. After Dr. Newman’s unprofessional emergency room behavior came to light, there have been three other accusations of acts of sexual assault and battery committed by Dr. Newman on his patients after they had been drugged. Since When Did Sexual Assault Become Part of the Care and Treatment of Patients? There is a fine line between what is considered a necessary touching by a doctor of his or her patient, and when that line is crossed and the touching becomes a form of sexual assault and battery. Bear in mind, sexual abuse is not always a violent act. All you need for an accusation of sexual assault is an unwarranted abusive (in the eyes of the one being touched) touching of one person by another person that is not only not wanted, but also considered to be an invasion of the dignity of that person’s “personal space.” It usually involves the touching of the victim’s genitalia. The touch is distasteful, and the person that is touched in such a manner feels violated. The touching becomes even more distasteful when it is done by a physician under the guise of medical care and treatment, and when the patient is sedated and unable to defend him or herself. See Los Angeles Times. In the Los Angeles Times article, patients were abused by their physicians during surgical procedures when they were unconscious. In some instances, other members of the surgical staff joined in on the abusive behavior of the doctor. In such instances, it is critical that the medical industry begin to police itself. Sexual abuse being committed by your doctor is something most people think of as a very rare occasion. Is it simply one of those crimes that often go unreported for various reasons? For those people that feel they have been abused during any physician’s examination, or other medical procedure, it is alright to question and report it. 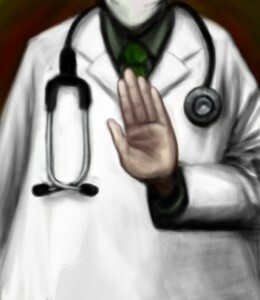 And for those doctors, who want to protect themselves from unreasonable accusations of sexual assault, you will need to employ a procedure to be used at all times, during any medical examination or treatment, that will not only reassure your patients that they are safe, but that will also minimize any potential accusations from any patient who believes, whether unreasonably so or not, that they have been sexually abused. For those physicians and other healthcare providers, in the event you are faced with any accusations of sexual assault, before you speak to law enforcement, speak to an experienced criminal defense attorney. Do not be like a Dr. Newman. The time to be creative in attempting to invent a defense,is not when you are being investigated for a serious crime like sexual assault. Your attorney will know what defenses, if any, you are entitled to.